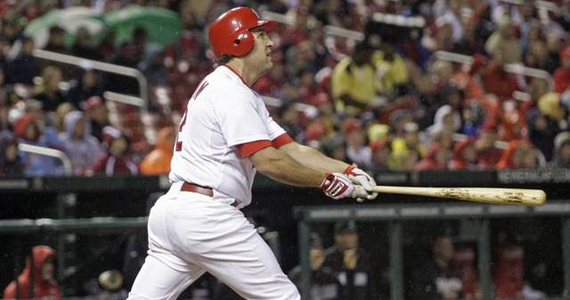 Fantasy Shockers: Really, Lance Berkman? Ok, I’m all for redemption stories, as can be seen by my posts about Bartolo Colón, Russell Branyan and Freddy Garcia. What I don’t like, is when i say that a player is all washed up and finished… and he hits nearly .400 in the first 5 weeks of the season. This is the case with Lance Berkman. Berkman, or “Fat Elvis” as he is known (also “Big Puma”), first came up as a 23-year old rookie for the Astros in 1999 and was one of the most feared hitters in all of baseball within two seasons. He would regularly hit over .300, hit as many as 45 home runs and averaged around 115 RBI per season. Then, in 2009, he suffered through his first really bad season. His average dropped to .274 and he only managed 80 RBI. In 2010, the wheels fell off. An injured berkman ended up hitting .248 and the Astros gave up on their franchise player and traded him to the Yankees at the July 31st trade deadline. On the Yankees, he hit only one home run and eight extra base hits. I saw him play every day and, except for a couple of key hits in the playoffs, he really looked terrible. No bat speed, an expanding waistline and a complete lack of the power he once used to terrorize the NL Central. Ok Lance, the Astros and I are very sorry we doubted you this off-season. Call off your dogs, we’re already dead. Enjoy the rest of your season, and I hope you don’t get suspended for steroids and retire like Manny Ramirez did.